AP Polycet 2016 Notification Apply Online Eligibilty :AP Polycet 2016 notification released by the govt officials for the admission into govt polytechnic colleges and aided and un aided polytechnic colleges for the year 2016-2017. polytechnic common entrance test is well known as Polycet .AP Polycet 2016 exam to be held on 27.04.2016 11.00AM to 1:00PM .AP Polycet 2016 Notification Apply Online EligibiltyThe State Board of Technical Education and Training, Andhra Pradesh, Hyderabad will conduct “Polytechnic Common Entrance Test (AP POLYCET 2016)” for the candidates seeking admission AP Polycet 2016 Notification Apply Online Eligibilty in to all Diploma Courses in Engineering / Non Engineering/ Technology offered at Polytechnics / institutions (including Aided and Unaided Private Polytechnics / Institutions AP Polycet 2016 Notification Apply Online Eligibiltyrunning as 2nd shift in Pvt. Engineering Colleges) in Andhra Pradesh State for the academic year 2016-2017. 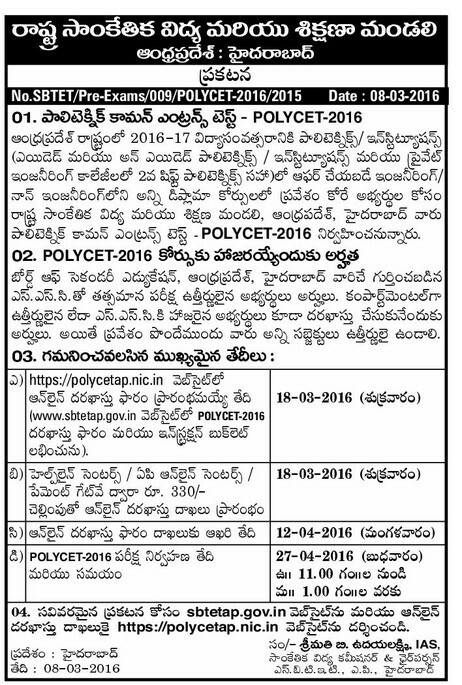 AP Polycet 2016 Notification Apply Online EligibiltyCandidates who have passed SSC or its equivalent and recognized by the Board of Secondary Education, Andhra Pradesh/AP, Hyderabad are eligible. AP Polycet 2016 Notification Apply Online EligibiltyThe candidates who have compartmentally passed or appearing for SSC are also eligible to apply. However, AP Polycet 2016 Notification Apply Online Eligibiltythey must have passed in all the subjects before seeking admission.